It’s a medical marvel from one Midwestern doctor with the help of a tiny Massachusetts lab. A prosthetic limb that can be controlled simply by thinking it to move is giving hope to amputees returning from war. JESSE SULLIVAN HAD BEEN A POWER LINEMAN FOR NEARLY 23 years in Dayton, Tennessee, a quiet town of 6,000 people. It’s a much sleepier place now than it was 80 years ago, when a high school science teacher named John Scopes was tried for teaching the theory of evolution. On a May afternoon back in 2001, City of Dayton Electric assigned Sullivan to move an overhead wire. It was a routine task: Back-feed the power supply, clamp the line, install a switch. Sullivan had done it thousands of times. He glided up in an aerial bucket. At the top, for a reason that to this day he does not understand, Sullivan reached out and touched the power line. He had forgotten to wear his rubber gloves. Seven thousand two hundred volts of electricity ripped through his body. Once. Twice. The current ricocheted off the sweat in one armpit, leapt over his chest, and sent a ball of fire tearing down his other arm. A surgeon would later find that Sullivan, then 54, had burned from the inside out – his bones heating up and searing his muscles and skin. The surgeon would have to amputate his arms at the shoulders, including the shoulder joints. His fishing friends would later joke that God had thrown their buddy back; he wasn’t a keeper. Sullivan is a religious man, and he knew there had to be a reason why he had been spared. Sullivan had cheated death. No one would have denied him a sinecure at his rural home, wearing some off-the-shelf prosthetic arms as he puttered around his yard. But that choice would have limited him forever. Sullivan’s loss was severe. The higher that the arm or leg is amputated, the more one’s flexibility and range of motion are lost. Losing a hand is better than losing an arm at the elbow, because the patient can still bend his arm and draw it toward his body. Losing an arm at the elbow is better than losing it at the shoulder. Sullivan had lost all of both of his arms. His body was a sheer cliff. Even the best prosthetic arms available would take him months to master, with no guarantee he’d ever be able to dress himself, shave, or sip a mug of coffee. Dr. Todd Kuiken, a specialist at the Rehabilitation Institute of Chicago, learned of Sullivan’s injuries when he came to be fitted with conventional prostheses. After meeting him, Kuiken knew Sullivan was the perfect candidate for his work, the culmination of more than 20 years of research. Sullivan might not have his arms, but he still had working nerves in his shoulder area. And they were crackling with information. Kuiken thought their power could be harnessed to operate a prosthetic arm, so that Sullivan could, in essence, command a fake arm to move just by thinking about it. And because Sullivan had been right-handed, Kuiken wanted to put the new arm on his non-dominant side. Sullivan would need a special prosthesis, one that was multijointed and powerful, one that would bend and extend with perfect coordination, as if it were a natural extension of his body. Kuiken, director of RIC’s Neuroengineering Center for Artificial Limbs, asked Sullivan to go under the knife once more. Kuiken then turned to the folks at a tiny lab in Holliston, Liberating Technologies Inc., manufacturer of the Boston Digital Arm System. THANKS TO SEAT BELTS AND SAFETY STANDARDS, prosthetics manufacturing is a small, static industry. About 200,000 people wear artificial limbs, according to a 1994 tally (the latest available). Innovations come quietly – after all, patients can live long lives without arms and legs. Few scientists pursue prosthetics research, because the market is minimal and the government doles out little money, except during times of war. The widget geeks at Holliston’s Liberating Technologies Inc. are just a few of the many crew members on a futuristic mission: to help a man move his artificial limbs as if they were the real things. ON A FRIGID JANUARY AFTERNOON THIS YEAR IN HOLLISTON, Craig Wallace glues electrodes to his thick arms and links the prosthesis that Jesse Sullivan will wear to a computer. It’s a battery housed in plastic molded to look like a forearm, in a color reminiscent of Crayola’s peach crayon. The plastic arm has a lifelike hand, flecked with painted-on hair. Wallace checks that the computer software is reading his own muscles’ electrical signals and correctly translating directions to the plastic arm. Wallace, an electronics designer, types on the keyboard. On the desk, the arm arches and the hand opens, then curls forward. The fingers splay out. It looks a bit like he’s operating Thing, the Addams Family‘s pet hand. LTI has sold prosthetic parts for hundreds of children with birth defects, adults who have survived car wrecks, and workers injured on the job. The upper-limb market is minuscule – only 13 percent of the country’s estimated 1.2 million amputees wear artificial arms. Most of the research and therefore most of the stunning developments have focused on the larger leg and foot market. “The upper extremities involve a spinal reflex and a higher level of human intent,” says MIT scientist Hugh Herr. Prosthetic legs are easier to develop and to use, in large part because “you can do an awful lot with just spinal reflex controls,” he says. In other words, to be able to pick up that cup of coffee involves thinking and acting on intentions. With walking, joints and muscles in the ankle perform almost instinctively. Many of the biggest prosthetics developers are international corporations that buy the rights to projects nursed over many years by individual researchers at large universities like the Massachusetts Institute of Technology. Liberating Technologies Inc. started out as a project of the Liberty Mutual Insurance Co. and became an independent company four years ago, moving its arm molds, worktables, computers, and seven employees into a bland office park just inside Interstate 495. While LTI is busy developing refined electronic prosthetics, it also repairs and provides limbs based on technology from the 1960s and ’70s. Sullivan uses a mechanical arm on his right side, which he prefers for tasks like writing. Mechanical arms with cable controls require the wearers to shrug and tense back muscles to move hooks. The Boston arm relies on another kind of muscle power: myoelectricity. When brain impulses stimulate a muscle to contract, the muscle generates a tiny amount of electrical energy. An electrode eavesdropping on the skin channels that impulse to the Boston arm. The arm’s microprocessor transforms that information into electric signals that can run arm, wrist, and hand motors. Technicians can program that microprocessor to bend or straighten the arm and open or close the hand at various speeds. 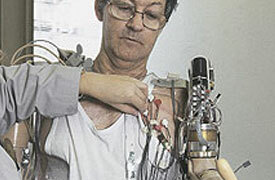 Soviet scientists developed the first myoelectric arm in the 1960s. It’s likely they took their cues from MIT mathematical genius Norbert Wiener, the man who founded cybernetics, the interaction of human and machine. Orthopedic surgeons at MGH discovered the Soviet experiment and, in Cold War style, wanted an arm of their own. Thus began “the most politically-intrigued project that I have ever witnessed at MIT,” says professor emeritus Amar Bose, founder of Bose Corp., of Framingham. To this day, the participants grouse about who deserves credit. Bose says that after a few years, he quit the project in disgust. For two years in the early 1960s, Wiener and Bose, along with surgeons at MGH and a few others, drew up plans for their own myoelectric arm. Bose says Wiener drove the project. “We were like technicians carrying out the invention of the man,” Bose says. By 1967, MIT professor Robert Mann and his graduate engineering students had fashioned an experimental design, funded by workers’ compensation carrier Liberty Mutual. More prototypes were made, and, in 1973, the company hired physicist T. Walley Williams III to transform one of the devices into an elbow that could be marketed. Williams teamed up with Bill Hanson in 1984. Hanson was a young MBA graduate, and he hit it off with the effervescent, Latin-spouting, world-traveling Williams. They continued developing the myoelectric arm for Liberty Mutual until the company decided to sell off some of its research subsidiaries in 2001. Hanson then created Liberating Technologies, making Williams its product development director. Initially, workers’ compensation paid for Sullivan’s medical costs. Kuiken’s current work is funded by the National Center for Medical Rehabilitation Research, a program of the National Institute of Child Health and Human Development. MANIPULATING AN ARTIFICIAL ARM REQUIRES A DANCER’S physical discipline and a chess player’s mental focus. Most amputees operate their artificial arms through a combination of muscle might and battery power. But the motions are slow and require awkward mental gymnastics, such as having to think about tensing the forearm to open the hand. Kuiken wanted to use Sullivan’s existing arm nerves to control his myoelectric arm. The doctor knew that the ulnar, median, and other nerves would still operate as if Sullivan’s arms were there, even if the nerves were surgically rerouted to muscles in his chest. When Sullivan thought about closing his hand, his brain would still fire his median nerve, and his chest muscle would contract, signaling the Boston arm to operate the hand. With his new arm, Sullivan could rake leaves, start the lawn mower, even feed himself, although it took time to learn how to eat soup. But challenges remained. He had to rely on his wife, Carolyn, to open a jar or tie his shoes. He longed to drive. Last year, Kuiken wanted to see how much more information he could coax from Sullivan’s nerves. Three other amputees had had nerve-transfer operations, but Sullivan, the first, was farthest along. As always, the patient was eager to try more. “He’s a saint,” Kuiken says. Kuiken’s crew obtained an experimental setup: a powered shoulder unit, along with an arm rotator and a hand with wrist-flexing and wrist-rotating abilities. Kuiken asked LTI to soup up a Boston arm that would let Sullivan bend his elbow, swivel his arm in and out and raise it over his head, rotate his wrist, and grasp. It wouldn’t quite make him the new $6 million man, but certainly someone worth tens of thousands of dollars. IT’S THE FIRST MORNING IN MARCH OF THIS YEAR, AND A BEVY OF technicians and researchers swirls around Sullivan in an exam room on the Rehabilitation Institute’s 17th floor in Chicago. Sullivan is standing with a wry smile while people paste electrodes to his chest and the experimental arm is locked onto his left side. He winks at himself in the mirror. He has a soft belly, spindly legs, and shaggy hair just starting to gray. He misses hugging his wife and compensates by throwing the empty arm of his leather jacket over her shoulder. At last, everything is ready. Laura Miller, the certified prosthetist, watches signals on a laptop computer. “Close hand,” she calls out. The hand snaps shut. “Can you lower the arm?” The shoulder motor grinds as the arm jerks down. Miller adjusts the motor’s speed with the computer. “Bend elbow?” It kinks. Sullivan’s chest muscle pulses. “Close?” The elbow flies up. “Don’t force it,” Miller guides. “Do a gentle open.” The elbow flexes. Hanson, the owner of LTI, smiles. Sullivan grows eager. His straightened arm begins climbing toward the ceiling. Higher, higher, the hand swiveling out. “Taxi!” Sullivan calls, raising his eyebrows. “Taxi!” Standing nearby, his wife, Carolyn, bursts out laughing. Sullivan tests the arm for two weeks. When he returns to Tennessee, his arm stays in Chicago for more development. In 2003, Kuiken discovered that when Sullivan’s scarred chest was touched, he felt sensations in his missing arm. Last month, Kuiken placed sensors on Sullivan’s prosthetic hand and wired them to a plunger device on his chest. The hand sensors trigger the plunger, which presses against Sullivan’s skin, allowing him to “feel” how hard he is gripping something. Others caution that science and industry are years from offering a similar arm to all amputees. The unit needs to be lighter and to be rigorously tested. And for an arm to be truly lifelike, it would need to have a hand with movable fingers. Doctors would have to tap multiple sites within a muscle or tease complex signals from a nerve or even the brain – work that is years away. And there’s a time limit: A year after amputation, nerve signals may start to grow faint. Sullivan says his arm is no longer an experiment. “I feel my own hand. In my mind’s eyes, they’re there.” He can’t wait to take the newest arm home; it is, after all, a part of him.